"A chocolaty, chilly soy smoothie full of healthy nutrients like protein and potassium. 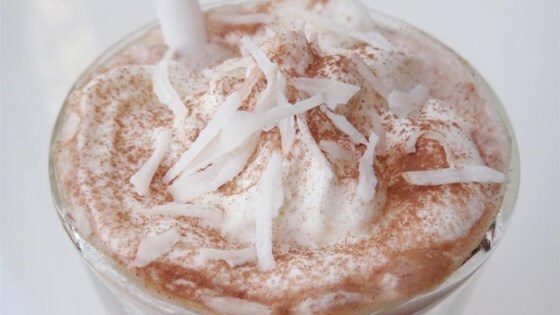 A tasty alternative to ice cream shakes, sure to please vegans and non-vegans alike." Blend ice, soy milk, banana, and peanut butter together in a blender until smooth. First chocolate smoothie I've ever had, and I enjoyed it. I used dark chocolate soy milk and added a little more crushed ice to reach the consistency that I prefer. I just substituted the soy milk for almond. YUM!!! I also used frozen bananas. IT IS SO DELICIOUS!!! I used part chocolate coconut milk & powdered peanut butter & was delicious!